Manual tasks are tasks with task mode manually scheduled. They should be used when you want to explicitly set a task's start and finish dates and not allow it to be changed automatically by the scheduler based on changes to other tasks. Duration, Start and Finish date can be text, number or dates -this values not used in scheduling process. Resources - can be assigned to tasks, these values are not used in the scheduling process. 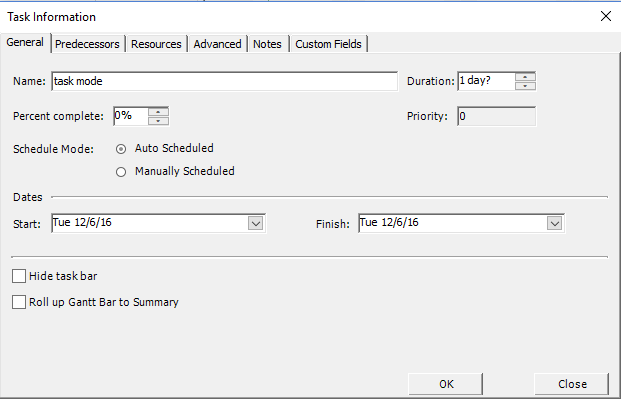 The Task Mode field indicates whether a task is scheduled manually or automatically, which gives you the option of deciding how much control you want over task scheduling in a project. By default, tasks are set as auto​ scheduled, with a start date, finish date, and duration calculated based on inserted fields values. The Task Mode field is not included by default. Use the Insert Column option to insert and ​display the Task Mode column in views like Gantt Chart, Tracking Gantt or Task Sheet view. To change the task mode, click in the field. In the list that appears, click Manually Scheduled or Auto Scheduled . You can also select specific tasks, then on the Task Information General tab, in the Schedule Mode group, select Manually Scheduled or Auto Scheduled. 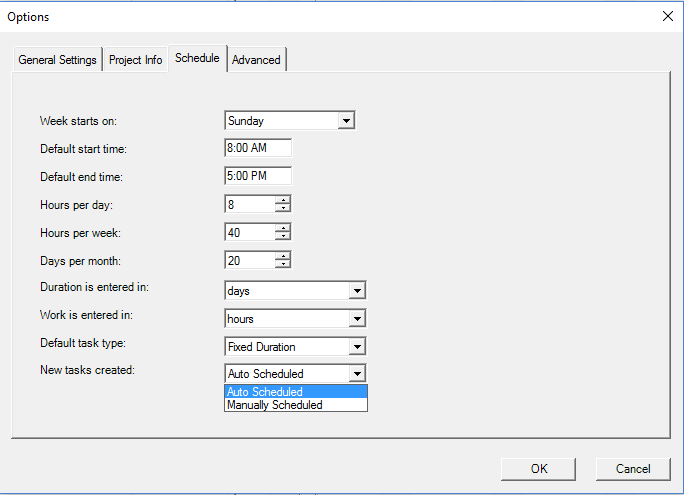 Before starting your plan, if you want to specify in your plan that all tasks are Manually Scheduled, set Manually Scheduled mode from Options dialog → Schedule tab. In this way, all the newly inserted tasks will be in Manually Scheduled mode.